Recommended level of 49. Required level of 40. Guy on my server paying 100p each so I went pharming. DON"T waste your time with Castle Mistmoore, Iridium is the only ore dropping there. Skyshrine isn't even mentioned here, but along with lots of Velium, I got a dozen bars fairly quick. 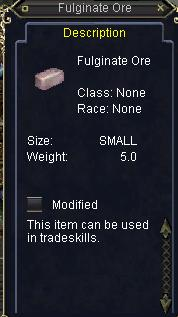 This is a global drop that drops from a certain level range of NPC's. If you find the sweet spot, it will drop anywhere as long as the NPC is in that level range. I stand corrected. I did not know that. In my defense, let me say again, a good amount of Fulginate Ore drops in Skyshrine, and it is not on the list. Thanks. I see alot of places it drop's but what about what you can make out of it can someone tell us this. there's nothing like a good fight. So fight to live and live to fight and if you die don't cry go back and fight again. Common drop in Maiden's Eye also. dropped from "A keeper" in Temple of Solusek Ro. Also dropped off a scorchclaw wizard in the Broodlands. and an aug (spotted lava rock) mana 30 end 30 fire 10 class all race all. req lvl 45 beleive aug was on "a tottering gorrilla" but all items were looted in burning woods. we maily were killing gorrillas and the occasional undead skelly and giant that was near us. mainly were killing trash mobs so not sure if they drop on names there. Noticed this stuff dropping last night along with some new silks. Funny thing is I switched to my newbie wizard in the mines and the silk was dropping there as well. Is there something going on this weekend? I was hunting Oceancrasher in Dulak's Harbor and this stuff started to drop off the ship's crew along with various types of silk and spinnarets. None of it could be sold to vendors.